The PINSTRIPE Contrasting Cook Shirt is manufactured in a 65/35 poly/cotton blend fabric. This blend produces cook shirts that are more stain resistant and require less maintenance than pure cotton shirts. These short sleeved cook shirts are designed to be the hardest working shirt for the hardest working chef. The PINSTRIPE Cook Shirt is Black with a white pinstripe pattern with black buttons. 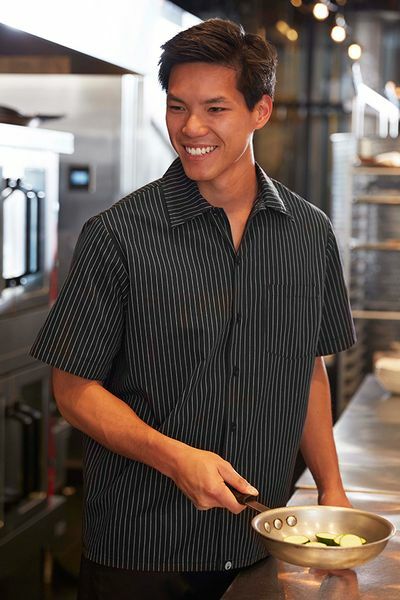 This Cook Shirt also features a left chest pocket and a single row of black solid buttons. The Pinstripe Cook | Utility Shirt is available in sizes XS - 3XL. Upsize charges do apply; please add $1 for XL, $2 for 2XL, and $3 for 3XL.